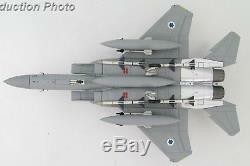 Hobby Master Air Power Series McDonnell Douglas F-15A Baz IDF/AF, #673 "Foxbat Killer", Shaul Simon, Tel Nof AB, Israel, 1981 1:72 Scale Diecast Model Length 10.75" Width 7.25" HA4553 features Diecast metal construction with some plastic components. Realistic panel lines, antennas, access panels and surface details. Pad printed markings and placards that won't fade or peel like decals. Opening canopies, revealing detailed cockpit interiors. Presentation stand to display the aircraft "in flight". Authentic detachable ordnance loads complete with placards. Accurately detailed underside with concealed screwheads. 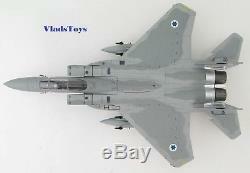 The item "Hobby Master 172 F-15A Baz IDF/AF Foxbat Killer Shaul Simon Tel Nof AB HA4553" is in sale since Friday, December 15, 2017. This item is in the category "Toys & Hobbies\Diecast & Toy Vehicles\Aircraft & Spacecraft\Contemporary Manufacture". The seller is "baronvlad" and is located in Ocean Springs, Mississippi. This item can be shipped worldwide.